Hogenakal is situated at the borders of Karnataka at 46 kms from Dharmapuri. 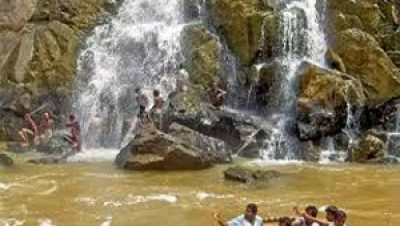 In Hogenakal the river Cauvery enters into Tamil Nadu as a big river with gushing water presentably as a natural falls. The name Hogenakal is derived from Kannada means ‘Smoky Rocks’. The river when falls on the rock below, the gushing force of water resembles like smoke emanating from the rocks. At Hogenakal the water spreads for miles around and on these waters cruising on country made dinghies (PARISAL) is possible. Parisal ride will give an enthralling experience. Surrounding by hills at various heights Hogenakal offers the visitors a different ambience and refreshing relaxations. 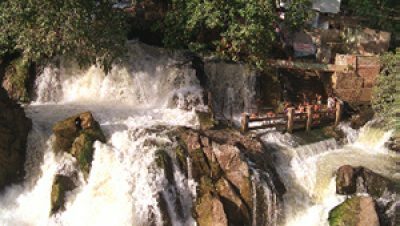 One could also take bath in the falls. Oil massaging by local people is a different experience. 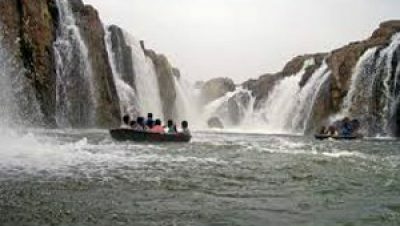 As the river flows throughout the year Hogenakal can be visited all days through the year. There are enough transport facility available from Dharmapuri & Krishnagiri. 7 Hours bus travel from Chennai. Hotel Tamilnadu - 04342-256447, A.S OM Muruga Lodge - 04342-256403, M S Lodge - 04342-256452, C M Lodge - 04342-256456.